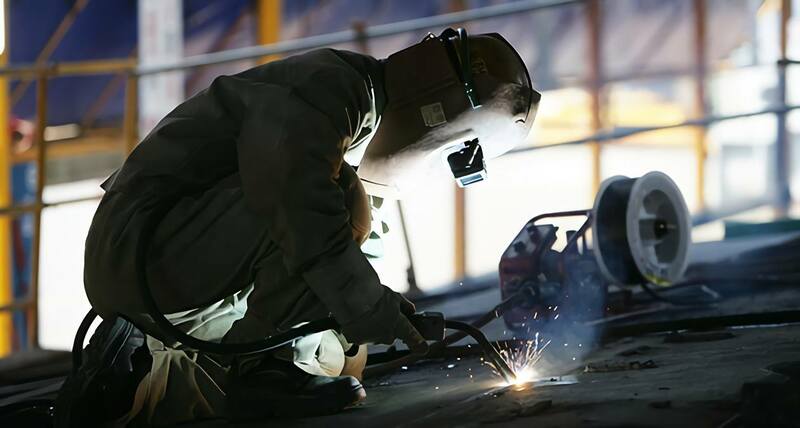 Welded joints have been steadily replacing rivets in the construction of steel-frame buildings. Welded joints offer tremendous savings in that a welded section offers more strength than a riveted section does. In fact, the loss of strength on a riveted section is substantial at 30 to 50 percent. Holes must be drilled in order to use rivets. These holes must be aligned accurately. There must be enough clearance to set rivets properly. The holes are sometimes punched instead of drilled; however, this process leaves residual stress around the hole. The hole needs a larger diameter to alleviate this stress. On occasion, the holes that are made ahead of time in the shop will not line up on-site. In this case, a drift is hammered into the hole, which squeezes the holes to allow the insertion of the rivet (or bolt). This process usually results in an inferior joint that is prone to cracking. When welding is used in the supporting components of a structure, the necessity for the use of heavy steel in the lower levels is eliminated. Welded sections can support the load of the entire structure. A building that is constructed using welded sections weighs at least one-third less than an identical building constructed using rivets. Another benefit of using less steel is a reduction in the overall cost of the construction project. Steve Sumner is the Director of Global Marketing for the Lincoln Electric Co., in Ohio. He states that welding is a productive and cost-effective method for joining metals. Sumner also speculates that the consumer welding market will continue to grow. Forbes recently released its Top 10 List of the hardest jobs to fill in 2014. For the fifth year in a row, skilled trade workers, including welders, are listed among the top 10 since 2008. In fact, skilled trade workers have remained number one on Forbes’ Top 10 List every year since 2010. This shortage is only slated to become more severe, as a large portion of the skilled trade labor force will retire in the upcoming years. According to data compiled by EMSI, more than half of America’s skilled trade workers are 45 years or older, and almost one fifth are over age 55. Moreover, the oil and construction boom in this country is driving up the demand for welders sharply. The Gulf Coast, for example, is already battling a severe welder shortage due to the unprecedented rise of shale extraction in the region. These labor shortages cause delays in the construction of the processing and refining facilities, threatening to slow down the boom and push back the projected date of energy independence, 2035 (as estimated by BP PIC). This promising labor market can drive more and more young people towards skilled trades careers like welding. While most high school graduates are encouraged attend a 4-year college program, one-third of college graduates do not work in occupations related to their fields of study according to a 2013 survey conducted by CareerBuilder. However, choosing to embark on a skilled trades career like professional welding can be a very economical alternative: Not only is the pay 1 encouraging – the median annual salary of $36,000 and 10% earn more than $56,000, you can also complete welding certification training in less than a year, thus starting to make money soon after your training. As the construction industry is booming and welding is becoming indispensible, professional welders face a bright future.